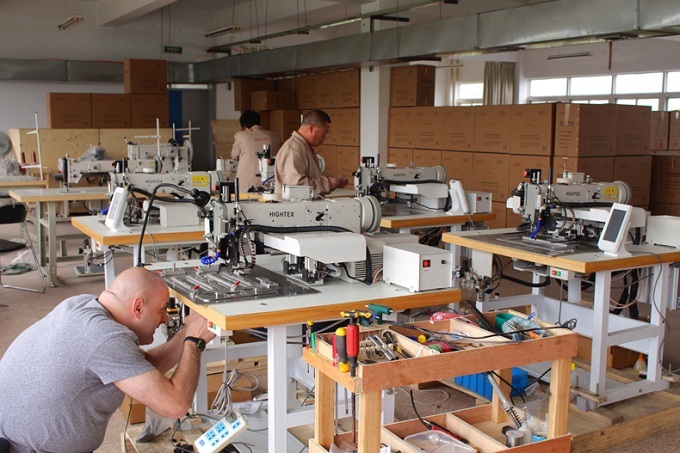 As leading manufacturer of heavy duty industrial sewing machines in China, we are looking for professional industrial sewing machine dealer in (except South Africa, as we already have excellent dealer in Cape Town, Africa) , to distribute our leather sewing machine (for saddlery and leather crafts), heavy duty automatic pattern sewing machine (for slings, harness and ropes), upholstery sewing machine (for thick thread decorative stitching or ornamental seams on leather sofas), as well leather crafting tools. The first generation of extra heavy duty automatic pattern sewing machine and bar tacking machine was born in 2006 - flexible for the manufacture of slings, belts, harnesses and ropes made of Nylon and Polyester, for industries such as cargo lifting and lashing, fire and rescue, safety & protection, arborist, automotive, aviation, marine and military. 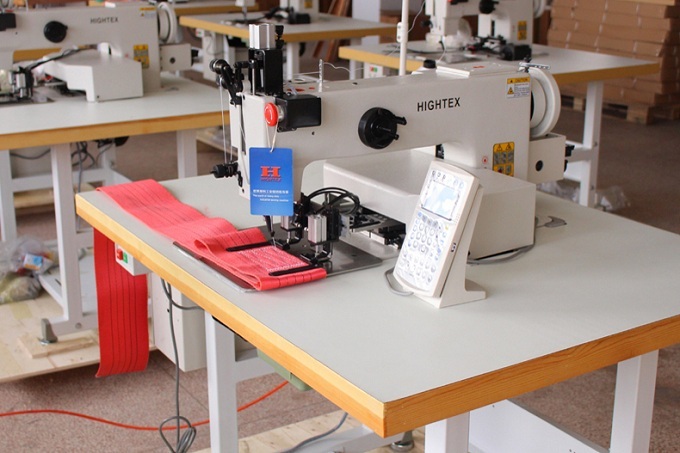 This automatic heavy industrial sewing machine is purchased by Tunisian company and manufacturer of webbing slings. 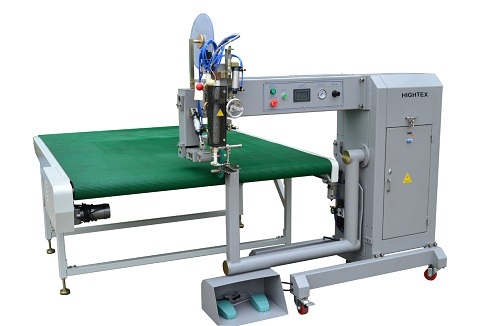 Large area programmable pattern sewing machine for automatic stitching 300mm wide heavy duty polyester webbing straps (for making 10T lifting sling, 10,000 KGS lifting sling). This automatic lifting slings sewing machine ordered by a French manufacturer of lifting and lashing strap (Fabricant de solutions de levage et d'arrimage) who has factories in Tunisia. 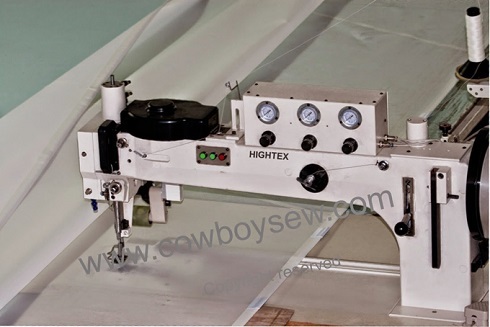 Hightex 828B Automatic hot cutting machine for heavy duty lifting slings and straps: this heavy duty industrial length cutting machine is designed for heat cutting 200mm webbing made of Nylon, Polyester, Polypropylene. The temperature of top and bottom heating blades is up to 600 C, can melting 10mm thick textile slings without any difficult. This automatic lifting slings cutting machine ordered by a French manufacturer of lifting and lashing strap (Fabricant de solutions de levage et d'arrimage) who has factories in Tunisia. 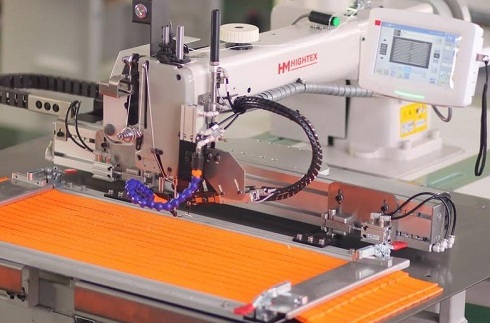 Automatic pattern stitcher with Barrel shuttle for heavy weight applications such as lifting slings, cargo lashing straps(reinforcement stitch or reinforced Eye), spanzet, military gear, backpack, fall protection equipment, parachutes rigging, hoisting belts, rescue belts and other critical area that needs extra reinforcement stitch. This heavy duty automated sewing machine purchased by a French company in Tunisia, specializes in the manufacturing and distributing of lifting, lashing and personal protective equipment products (Fabricant de solutions de levage et d'arrimage)., and the manufacturer of industrial lifting sling and rigging industries in Algeria. 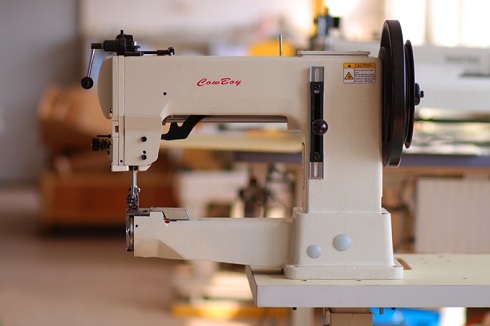 Extra high lift walking sewing machine and alternating presser foot for the produce synthetic slings, straps, harness, buffs and other difficult to sew materials. Can easily sew 6-8 ply synthetic webbing slings (3.5mm of each) together. 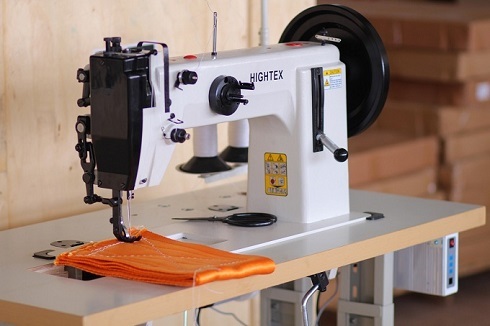 Extra heavy duty triple transportation (walking foot and compound feed) lock stitch sewing machine with large Barrel shuttle hook, ideal for stitching 2-5 ply Nylon or Polyester slings in the production of heavy duty lifting slings, cargo lashing straps, safety harness and other synthetic webbing products. 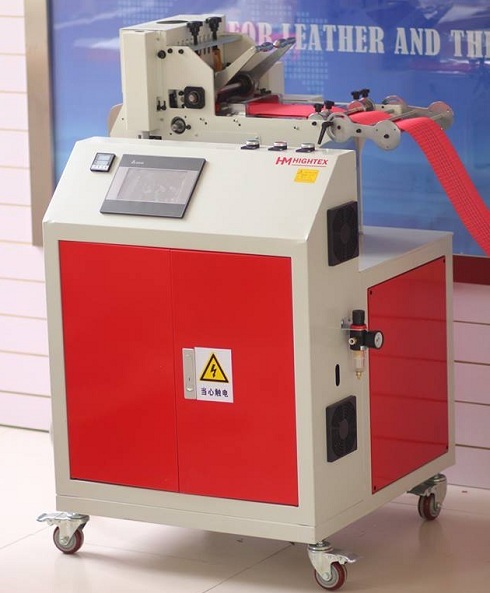 This webbing sewing machine ordered by the manufacturer of slings and seller of lifting equipment in Tunisia, and the large manufacturer of buffing wheel in Tunisia. The CowBoy CB243 leather stitching machine is capable of sewing up to 7/8" of hard temper leather, man-made leather substitutes (like "BioThane®"), heavy nylon webbing, Kydex, and even nylon or plywood lined items, with up to #415 bonded nylon or polyester thread. This extra heavy duty sewing machine is exactly interchangeable with Juki TNU-243 and similar to Seiko TH-8B. 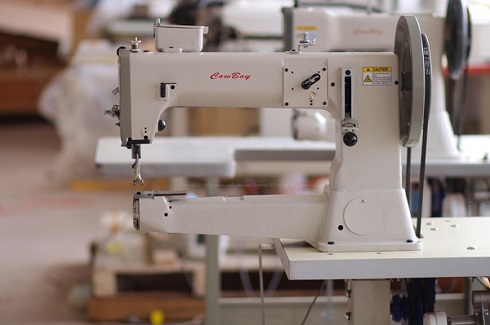 This heavy weight industrial sewing machine ordered by the manufacturer of webbing slings in Casablanca, Morocco. 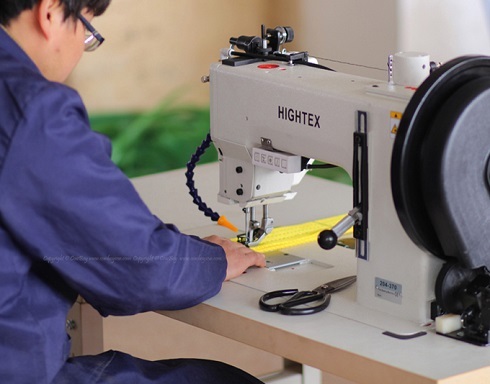 Specialized industrial sewing equipment for stitching heavy weight materials, such as lifting slings, cargo lashing straps and safety harness, Ratchet Tie Down straps, safety harness for work at height, Tatami mats, military equipment, backpacks, crane slings, lanyards, spanzet, safety belts and sails corner patch. 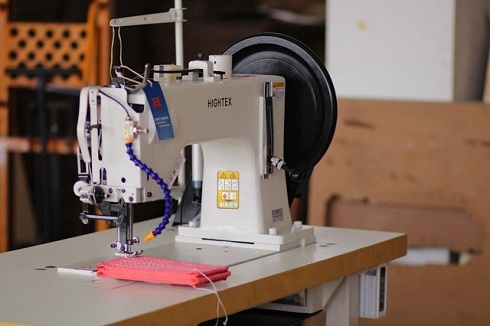 This low cost heavy industrial sewing machine purchased by a manufacturer of industrial lifting sling and rigging industries in Egypt. 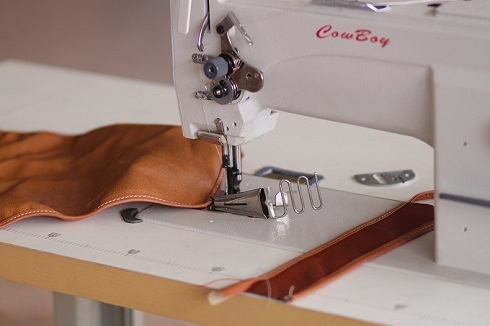 The 7618 machine is an excellent machine for sewing lightweight and medium weight leather items as well as canvas and nylon webbing. It excels at sewing chaps, chinks, wallets, purses, handbags, lightweight pet and horse products, turn out sheets, horse blankets, as well as indoor and outdoor upholstery, marine vinyl, automobile upholstery, various coated and laminated products, synthetic and genuine furs, fleece, hair on hides, and the like. This heavy weight industrial sewing machine ordered by the industrial sewing machine importer in Algeria. Hightex 205-370 heavy duty triple feed lockstitch sewing machine is a specialized thick thread upholstery sewing machine for decorative topstitching seams on leather and upholstery fabrics in the production of sofas covers, car seat covers, marine upholstery and general upholstery panel. Up to 14 mm long stitches for decorative topstitching seams. Enlarged Barrel shuttle hook can sew extremely thick thread without any problem. This leather sofa sewing machine ordered by the furniture manufacturer as well as sofa manufacturer in Tanzania. Based on a popular German design and German engineeering, these machines are an excellent choice for those persons seeking a technologically advanced sewing machine for sewing leather, nylon webbing, heavy canvas, beta and biothane webbing, as well as various coated and laminated products. This heavy leather sewing machine ordered by a shoe factory in Harare, Zimbabwe. CB4500 Heavy duty leather sewing machine for saddlery and harness -- Sews saddle and harness better than any other stitcher built today! his machine has become the standard in the saddle and harness industry. It has been widely used for stitching bullet loops, saddle skirts, headstalls, halters, breatstcollars, holsters, knife sheaths, chaps, knee pads, covered stirrups, gun belts, cases and other leather craft. This saddlery sewing machine purchased by a leather work shops in Namibia, through CowBoy sewing machine dealer in Cape Town, South Africa. Sailmaster 366-76-12-M is recognized as the ultimate sail maker sewing machine currently available. Standard supplied with 4 cams for straight stitch, 1-step (2-points), 2-step (3-points), 3-step (4-points) zigzag, cover all demands of modern sail making industry. 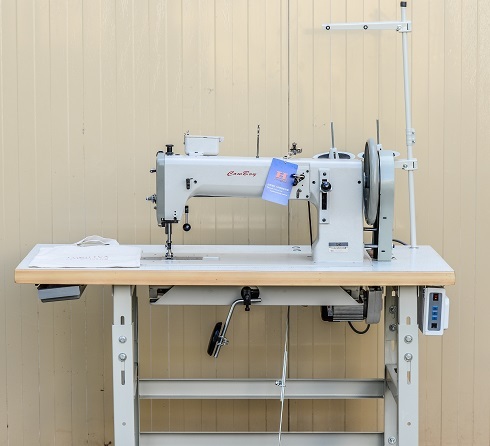 This sail maker sewing machine ordered by sailmaking company located in Arsenal, Mauritius. Hot air welding machine is rotary hot air sealing machine to join thermoplastic fabrics and industrial fabrics, such as: PVC, PU, PE etc. Ideal for manufacturing inflatable boat, inflatable tents, pvc ventilation pipe, pvc duct pipe, inflatable castle, and inflatable advertising. This hot air inflatable welding machine purchased by 2 inflatable boats manufacturers in Cairo - Egypt.